Congress party General Secretary and eastern Uttar Pradesh state in-charge Priyanka Gandhi Vadra, right, waves to party workers as she undertakes a steamer ride in the River Ganges from Manaiya, 25 kilometers (15.6 miles) from Prayagraj, India, March 18, 2019. 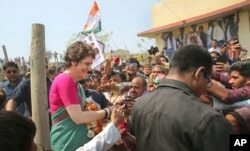 Priyanka Gandhi Vadra, the latest high-profile member of India's famous Nehru-Gandhi dynasty to enter the political arena, has embarked on an unusual three-day boat rally to launch the Congress Party's campaign in the battleground state of Uttar Pradesh. But questions have been raised about whether she can boost the fortunes of the party that was decimated by Prime Minister Narendra Modi in 2014. Congress party General Secretary and eastern Uttar Pradesh state in-charge Priyanka Gandhi Vadra, center, takes a boat ride to the Sangam, the confluence of sacred rivers the Yamuna, the Ganges and the mythical Saraswati, in Prayagraj, India, March 18, 2019. Taking a cue from the Hindu nationalist party, Vadra offered prayers Monday at a temple before embarking on the river that Hindus consider holy. She called the Ganges a "symbol of truth and equality." Some see her river rally as a challenge to Modi, who in 2014 had said that he had been called by "Maa Ganga" to run in Varanasi — an appeal to the BJP's core Hindu constituency. 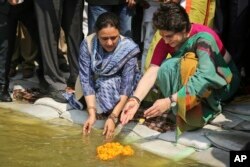 Congress party General Secretary and eastern Uttar Pradesh state in-charge Priyanka Gandhi Vadra, right, prays at the Sangam, the confluence of sacred rivers the Yamuna, the Ganges and the mythical Saraswati, in Prayagraj, India, March 18, 2019. "She has inherent charisma, personality, she has shown certain amount of spark, she is in the same strong leader mold which was her grandmother's, which is of Modi," said Nilanjan Mukhopadhyay, a political analyst in New Delhi. Congress party General Secretary and eastern Uttar Pradesh state in-charge Priyanka Gandhi Vadra, left, meets party supporters before undertaking a steamer ride in the River Ganges from Manaiya, 25 kilometers (15.6 miles) from Prayagraj, India, March 18, 2019. "Priyanka always grabbed the headlines, but I doubt on the ground whether she will make that much of a difference," said independent political analyst Ajoy Bose. "People will talk about her, but I don't see the Congress being transformed because of her." Bose says this is a "make-or-break" election for the party, which needs to dramatically improve on its 44 seats in parliament. "It is very important for the Congress to get back into three figures for them to have a future in Indian politics," he said. The BJP, meanwhile, will try to turn Vadra's entry into politics against her party, having long mocked Congress for "dynastic politics" because its leaders have always come from the Nehru-Gandhi family. It has often contrasted the "entitled" Rahul Gandhi and his sister with Modi, the son of an ordinary tea-seller who made it to the top on his own merit. The great grandson of India's first prime minister, Rahul is the sixth member of the Nehru-Gandhi family to lead Congress. His mother handed leadership of the party to him in 2017. "She definitely is the X factor; what is the value of X we don't know," Mukhopadhyay said.